What’s driving disaffected voters to political outsiders like Donald Trump? One big factor is America’s abandonment of labor-intensive manufacturing, and its rush toward a hi-tech, eco-friendly, creative economy that excludes many workers. This abandonment is perhaps most clear in Pennsylvania, a battleground state the polls say Trump will handily win in Tuesday’s primaries. Voter surveys tell us that the best predictor of Trump’s support is how much education a primary voter has. Those who didn’t go to college back him in overwhelming numbers. And two-thirds of Americans over the age of 25 do not have a bachelor’s degree, making them a potentially decisive bloc in this year’s elections. These are the very households that have been hammered by shifts in the economy over the past several decades. In steel-town Pennsylvania—from Erie in the northwest to Johnstown in the southwest, to Bethlehem in the east—city populations have fallen steadily since the 1960s. Half the state’s manufacturing jobs have disappeared since 1990, wiped away by automation and foreign and domestic competition. These Trump voters are part of a much larger and worrying story. As a sociologist who studies the working class, I’ve seen firsthand the financial and psychological toll that job loss and economic change have on men and women. In interviews I recently conducted on unemployed autoworkers, I found that as spells of joblessness stretched out into months and years, stress and shame deeply affected these workers, making many of them vulnerable to suicidal thinking and family breakups. Pennsylvania’s manufacturing cities have had some luck in turning to other industries, such as plastics, wind turbines, and biofuels. Indeed, Pittsburgh is often held up as a national success story—a city that has adapted agilely to the shuttering of its factories by embracing the new economy. It may still be home to the Steelers football team, but Pittsburgh’s recent economic growth has revolved around its booming tech and health care sectors, which have lured a well-educated creative class of young professionals and spurred a downtown revitalization. But large swaths of the working class find themselves out of the running for many of these new good jobs, which increasingly go to people with college degrees. Nationally, of the 2.9 million good jobs created since the recession, 2.8 million have gone to the college-educated, according to a recent Georgetown study. While wages for men and women with bachelor’s degrees have risen, those for working-class men have plummeted. 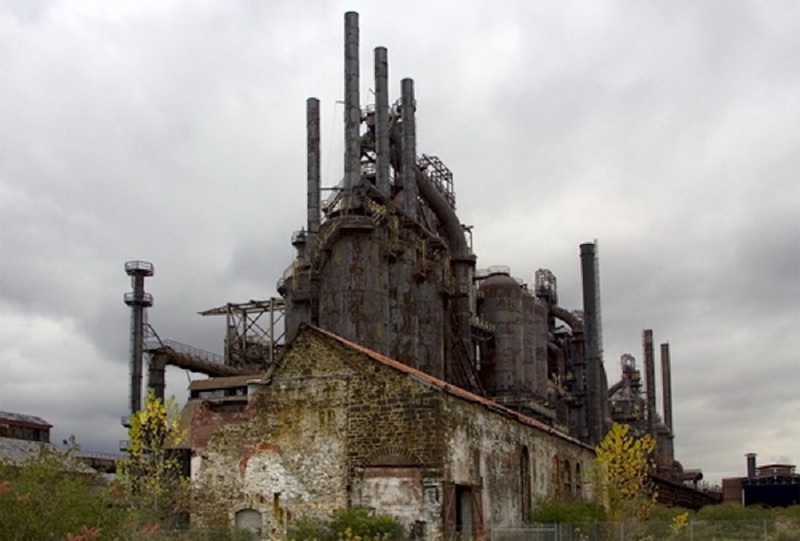 One symbol of where things are headed is Bethlehem Steel. Once a global powerhouse, the company was dissolved in 2003. Six years later, the Sands Casino Resort Bethlehem opened for business on the former grounds of its historic steel plant. Recently, there has been much happy talk in this country of a bonanza from fracking and a trend toward “reshoring” manufacturing jobs. Pennsylvania’s boom in fracked natural gas was supposed to deliver good jobs to the countryside. The state negotiated hard to get Shell to build an ethylene plant in the western part of the state that was expected to create more jobs in plastics. With natural gas prices falling, however, the jobs have dried up and Shell has not built the plant. At the same time, the state’s manufacturing sector has never recovered from the recession, with job growth flat since 2010. Today, many of the new manufacturing jobs being created in this country pay lower wages and are located in the South, where state laws make it harder to organize workers. Meanwhile, new industries are emerging that seem to herald worse times ahead for the working class. In Nevada, Daimler, the German carmaker that owns Mercedes-Benz, is testing driverless trucks, which may put in jeopardy at least some of the country’s 1 million truck-driving jobs. And trucking is the most common job to be found in Pennsylvania, as well as many other states. Last year, Uber poached a third of the staff at Carnegie Mellon’s robotics center. (The university, which is based in Pittsburgh, was an early pioneer in developing self-driving cars.) If Uber successfully implements this technology, legions of human drivers will be out of work. In this context, working-class desperation is hardly irrational, as some media have portrayed it. Recent research has uncovered spikes in suicide and drug poisonings over the past few decades, particularly among the white working class. According to data from the Centers for Disease Control and Prevention, suicide rates—which have risen across demographic groups since 1999—are higher in smaller cities like those in Pennsylvania’s heartland. Meth is a booming business in the Rust Belt, and overdose deaths from opioids and other drugs have soared. The biggest issue motivating Trump voters is, of course, immigration. While his supporters may see the threat it poses more in terms of culture—concerns that immigrants are challenging their way of life and, in some cases, flouting the rule of law—the perception that these newcomers drive down wages for the already dispossessed can stoke the anger. In the Rust Belt, these fears also fit a narrative of decline. The country’s economic center of gravity has shifted to states where immigrants dominate—led first by California, and now by Texas. Meanwhile, their region, once the world’s workshop, has been passed over, and their communities, once vibrant, have been left to rot. No wonder the white working-class in inland Pennsylvania and other links of the Rust Belt are feeling left out and riled up. More broadly, the middle class needs to take the issues of the working class seriously—and condescendingly. Part of Trump’s appeal is that he speaks in ways that acknowledge the pain of the working class—at least the white portion of it. Sure, he is a billionaire from a wealthy family, but he treats working people as adults who have real concerns. Contempt among the well-educated for those who lack college degrees or live in the “flyover” country of America’s midlands can heighten the appeal of demagogues who speak the language of working-class pride and nativism, as George Wallace did in decades past, and Trump does today. In places like Erie and Johnstown and Bethlehem, there is desperation and anger—and this election may hinge on who can best channel it. Victor Tan Chen is an assistant professor of sociology at Virginia Commonwealth University and the editor-in-chief of In The Fray. He is the author of Cut Loose: Jobless and Hopeless in an Unfair Economy and on Twitter @victortanchen. *Photo courtesy of Atomische * Tom Giebel.